It is backstamped EPIAG DF Carlsbad Czechoslovakia . 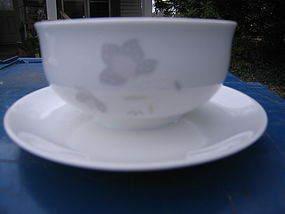 I have not been able to find a pattern name, but the original box is stamped Dekor 73168 Form Menuet. For me, it is very difficult to capture a good image of the pattern, but will provide additional close-up pics, upon request. The flowers are gray and tan with white dots. Item M-10055 on this site has a close up of the pattern (enlargement 2). This gravy boat is coming from the original box and does not appear to have been used. I need your zip code to calculate the postage.